Ray McKinnon has hailed the arrival of goalkeeper Cammy Bell as a "marquee signing" that could save Dundee United at least 10 points a season. The 29-year-old has negotiated an early release from his contract with Rangers, where he had been for three seasons. "If you get your goalkeeper right, it can save you 10 points a season at least," said manager McKinnon. "He wants to push back into that Scotland squad, which means we are getting a hungry player." 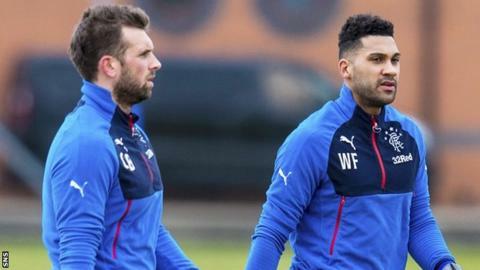 Bell, who has one Scotland cap, did not make a single appearance for Rangers last season after manager Mark Warburton signed Wes Foderingham. Now Rangers are in talks to sign Matt Gilks, the Scotland international goalkeeper released by Burnley. Bell, who had loan spells with Montrose and Queen of the South while he was with Kilmarnock before joining Rangers in 2013, had attracted rival interest before agreeing a two-year contract at Tannadice. "We targeted Cammy and we had to work hard behind the scenes," McKinnon told BBC Scotland. "It was nearly hijacked at the last minute. "I think that is a key area of the squad that we had to address when we came in here." The news of Bell's capture came as United paraded McKinnon's first signing as manager - Stewart Murdoch, the midfielder released by Ross County - for photographers. "He is going to be a big player for us next season," said the United manager of the 26-year-old who made 34 appearances in his season with the Premiership club. "He is everything we are looking for in a player. "He is a good football player, he is the right age, professional, he can pass, he can win the ball back, go box-to-box if we like, or he can sit, so he is the ideal player for next season and I am absolutely delighted to have him on board." McKinnon also says he is hopeful there will be more additions to his squad in the coming days. "We are in discussions with more players at the moment," he added. "The people I am speaking to are actually in contract with other clubs and it is negotiations at the moment. "Hopefully, in the next 10 days, we may have two or three signings."